CATBALOGAN, Samar – The recruitment office of the 8ID, Camp Lukban, Catbalogan, under Lt. Col. Joel Paloma of G1, announced recently the opening of 350 slots for incoming soldiers for the Philippine Army. Procurement Officer, Lt. Emerson Borja, disclosed that on February 2, 600 examinees trooped to 8ID Camp Lukban, barangay Maulong to take the examination and on the following day, 550 more took the test at Leyte Colleges, Tacloban. 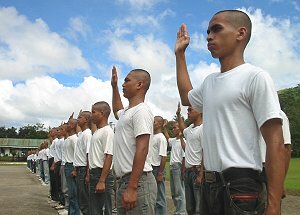 Of the 1,150 examinees however, only 264 passed the physical fitness test. The officer also admitted that should a few of them would not make it in the physical test, they will be given a second chance. Three batches will be offered to the trainees: 1st batch with 125 trainees, 2nd batch 125 and 100 for the 3rd batch. The trainees will hurdle the 19-weeks rigid training; 13 for basic theories and principles and six (6) weeks for jungle warfare course. Asked why he allowed his son to join the military service, a father who requested anonymity confessed that poverty drove his son aside from the mere fact that he always wanted to get hold of a toy gun during his childhood days. It was learned that a new entrant to the military service receives not less than P12,000 in monthly salary. NAVAL, Biliran – The stranded bottlenosed dolphin in the municipality of Almeria yesterday was found dead in the shores of Brgy. Jamorawon, municipality of Almeria, Biliran, this morning. The dead dolphin was already buried when Aileen Jornales, Aquacultural Technician II of the provincial government of Biliran came to the location. Jornales instructed the barangay tanods to unearth the corpse for examination. Jornales then dissected the abdomen part of the mammal for necropsy with Dr. Suzette Apura, provincial veterinarian and at the same time chairman of the Philippine Marine Mammals Stranding Network (PMMSN) – Biliran Chapter. Aside from the bruises and thin cuts on its skin, its left lung was found to be darkening. Dr. Apura declared drowning as the cause of death of the dolphin. The dolphin which was found at around 6:00 o’clock in the morning yesterday in the shallow waters between Capiñahan and Dalutan Islands was brought back to the deeps for three times by bantay dagat members and local fishermen of the municipality of Almeria. However, it kept coming back to shore. 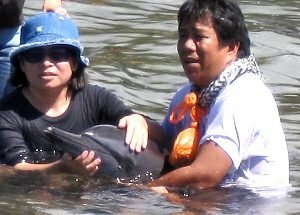 Since the dolphin was found to be able to float and swim and of normal breathing except for the thin cuts on its skin, it was released again but monitored by the bantay dagat. Had it came back to the shores yesterday afternoon, it would have been brought to VRC Resort in Brgy. Talahid in the municipality of Almeria for a three-day rehabilitation and to undergo medication. The dolphin did not return to the shores of Almeria town proper but was stranded in the adjacent barangay of Jamorawon where local fishermen brought it to the deeps. At around 7:00 o’clock this morning, the dolphin was found trapped in the rocks probably during ebb tide which caused its death. The dead body of the dolphin was turned over to Mr. Sofronio Dacillo, Provincial Environmental Management Specialist II of the province of Biliran, where it was buried within the capitol compound. In January 20, this year, a bottlenosed dolphin of more than 2 meters long was reported trapped in a local fisherman’s net and was already dead when noticed. The local fisherman of Almeria caught the dolphin near the waters of Sambawan Island in Maripipi in Biliran province. TACLOBAN CITY – The Social Development Committee (SDC) of the Regional Development Council (RDC) of Eastern Visayas conducted a consultation on Monday, February 7 on the budget of several national government agencies (NGAs) and State Universities and Colleges (SUCs) in Region 8, in its first committee meeting held at RDC Conference Room of NEDA 8. The budget consultation is in accordance with the provisions of Section VI of the National Budget Memorandum Circular 107 entailing for the RDC to conduct budget consultations with the NGAs, SUCs and LGUs for the purpose of reconciling program thrusts of the agencies and evaluating existing programs and projects and to secure feedback on the impact of these programs and projects. NGAs in the region that have submitted their programs and projects’ budget subject for consultation are those which belong to the Social Development Committee. These include DOH, DepEd, DSWD, DOST, TESDA, NHA, CHED, DOLE and DILG. SUCs in the region that have submitted their programs and projects’ budget subject for consultation are the following: Leyte Normal University (LNU), Naval State University (NSU), Samar State University (SSU), Eastern Samar State University (ESSU), North West Samar State University (NWSSU) and Southern Leyte State University (SLSU). According to Mr. Manuel Calero, Head of the SDC Secretariat, each member of the committee can give feedback to the programs and projects’ budget of each NGAs and SUCs as long as the member has firsthand knowledge, official reports, perceived importance and has issues to be raised related to the programs and projects. Calero said that feedback from each member is focused on the on-going programs and projects of NGAs and SUCs in 2011, their programs and projects which require funding allocation for 2012 and their programs and projects to be implemented in 2012-2014. He explained that each SDC member will fill-up feedback forms, secretariat will summarize the feedback of the programs and projects and the summarized feedback will be presented to the RDC on February 18. SDC will welcome all comments from each SDC member and each respective NGAs and SUCs will be given a copy of the feedback for their perusal, Calero said. Meanwhile, DOLE Regional Director Forter Puguon, SDC Chair, hoped for a fruitful and meaningful first meeting of the SDC. Director Puguon emphasized that the activity is a paradigm shift in the usual budget process in order to ensure that available public resources are maximized for core vital government services with the greatest beneficial impact on poverty reduction and equitable growth. BORONGAN, Eastern Samar – The army through the 8th Infantry Division (8th ID) hailed the cooperation of civilians in tracking down the presence of rebels in their communities. Through the army’s implementation of the Internal Peace and Security Plan “Bayanihan” (IPSP-Bayanihan), they were able to achieve what they term as ‘tactical accomplishment’. According to an army official, it means that smaller troops have done successful combat operations. One of those cited includes an incident where residents of Barangay Salvacion, Can-avid, Eastern Samar reported the presence of armed New Peoples Army in the said barangay to the troops of 14th Infantry (Avenger) Battalion. As the troops responded, they encountered a group of more or less eight communist rebels in the morning of February 6, 2011. The firefight, according to a report penned by Lt Col. Noel Vestuir lasted for almost fifteen (15) minutes after which the rebels believed to be members of the New People’s Army (NPA) withdrew towards different directions. The army added that no casualty was reported on the government side while undetermined on the NPA side. The troops of 14th IB recovered one caliber 5.56 M16 armalite rifle with one magazine filled with 20 rounds ammunition and one US rifle M1 carbine that were left behind by the withdrawing NPAs. In another part of Samar, the 803rd Brigade (803rd Bde) encountered an undetermined number of NPA’s near the boundaries of P. Rebadulla of Catubig and Barangay San Jose of Mapanas both of Northern Samar. Firefight ensued and no casualty was reported on the government side. The troops recovered personal belongings from the fleeing rebels. The army believes that the people have rallied behind the government troops in their support, thus the influx of civilian tips when enemies of the state are around. The 8th ID Commanding General, Major General Mario F. Chan, expressed his appreciation for the support of the people and also congratulated the troops for a job well done. “I am happy to note, that as we implement the government’s Internal Peace and Security Plan “Bayanihan” we gained positive responses from our people,” Chan said. He emphasized that his army can never accomplish the same without the people’s cooperation. “With the timely information, our troops have prevented whatever violent activities and plans of the rebel groups that may have endangered the lives of our people,” General Chan concluded. CATBALOGAN, Samar – Contrary to pronouncements from the Tan’s camp that the petition to recall them from their present positions are premature and is a futile exercise, the Comelec en Banc released a decision that favored the petitioners and declares the petitions to be sufficient in form and substance. Samar News has been in possession of an excerpt of the Minutes of the Regular en Banc Meeting of the COMELEC held on January 12, 2011 that ordered its Deputy Executive Director for Operations of the Commission to implement the resolution that favorably considers the Petitions for Recall of Governor Sharee Ann T. Tan and Vice Governor Stephen James T. Tan of the province of Samar as sufficient. The resolution was signed by COMELEC Commissioners Rene V. Sarmiento, Nicodemo T. Ferrer, Lucenito N. Tagle, Armando C. Velasco and Elias R. Yusoph. Commissioner Gregorio Y. Larrazabal was on official business and Chairman Jose A. R. Melo has already tendered his resignation during such deliberation, thus their failure to affix their signatures. The decision came as a result of a manifestation and prayer made by Sardillo and Fong Law Office, counsels for Mr. Aurelio A. Bardaje, Jr. and Ms. Elvira A. Lopez. 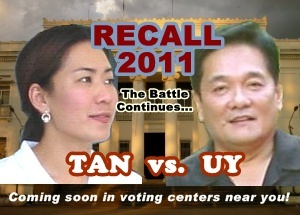 Bardaje and Lopez are the petitioners for recall of the two (2) Tans. A Certification signed by Mariano A. Gabito, dated December 15, 2010, from the Bureau of Local Government Supervision, DILG, Quezon City, has been made part of the Petition in lieu of a Certification of Assumption to Duty which the DILG Provincial Office of Samar has failed to issue. Previously, in two (2) separate memoranda, both dated December 13, 2010, Acting Executive Director Sinocruz for Operations of the COMELEC recommended for a resolution certifying that the petitions for recall against the Tans are insufficient because of its inability to submit a certification issued by the DILG on the assumption to duty by the local elective officials sought to be recalled. It has been on record that the Provincial COMELEC’s Office headed by PES Atty. Corazon Montallana received the two (2) petitions on December 3, 2010. Based on Montallana’s determination, the petition for recall against Gov. Tan complied with all requirements set forth. On the other hand, that of Vice-Governor Tan was rendered insufficient in form and substance. Moreover, PES Montallana reports that the Samar DILG Director claimed to have not received any document that would serve as basis for the Tans’ date of assumption, thus their inability to issue such certification. However, in lieu of such certification, the petitioners attached certified true copies of two (2) memoranda dated July 15, 2010 and December 1, 2010 issued by Governor Sharee Ann T. Tan and Vice-Governor Stephen James T. Tan to a certain Rondita A. Ordona and Laureano A. Aguilar, respectively, which are indications that the Tans were performing their duties on that particular date and created a presumption that they have assumed their offices as Governor and Vice-Governor of Samar. The COMELEC asserts that the date of assumption must be proven with absolute certainty and not by mere presumption. The date of assumption to office of the official sought to be recalled is used to determine when the recall election shall be conducted. Section 3 of Resolution No. 7505 provides that the recall election should be conducted not earlier than one (1) year from the date of assumption to office of the official sought to be recalled and not later than one (1) year immediately preceding the next regular local election. Finally, the DILG Certification submitted by the counsel of petitioners was successful in proving that the local officials sought for recall are duly elected officials for the term July 01, 2010 up to June 30, 2013. This document facilitated in the recent Resolution that declares both petitions against the Tans to be sufficient in form and substance. Likewise, Section 12 of Resolution No. 7505 as amended requires the Provincial Election Supervisor to determine whether the required percentage or total number of signatories has been attained based on the certification on voting population issued by the National Statistics Office (NSO) and that all requirements prescribed in said resolution have been complied with. The petition was found to have Seventy Three Thousand Eight Hundred Eighty Nine (73,889) supporting petitioners which is 22.27% of the registered voters as of May 10, 2010. The names and signatures were embodied in the Seven Thousand Five Hundred Seventy Five (7,575) pages attached to the petition. Sec. 6 of the same Resolution 7505 requires at least 10% of the 300,000 or more voting population but not less than 45,000 is required. The petition have met said requirement. Furthermore, the prescribed filing fee with a voting population of over 300,000 amounting to Fifty Thousand Pesos (Php50,000.00) pesos has also been complied. Ms. Elvira Lopez, one of the petitioners, was so happy about the recent development. She hopes that the Samarnons will be given the chance to decide for their future. “We need that much needed change now. Now is the right time for the Samarnons to work together for the interest of everyone” adds Lopez. Mayor Reynaldo S. Uy of Calbayog City refused to comment on the legal implications of the resolution during a brief interview. “I am not a lawyer… However, I am so glad that this effort has been progressing. This is a welcome development for all Samarnons. I am ready to accept this challenge and I can see that people are now working together to topple down this provincial administration that is so much tainted with corruption, illegal and immoral transactions. I hope that people will soon realize the need to improve our lives as Samarnons and develop Samar. We need to do it now” was Mayor Uy’s comments on the issue. Mayor Uy has been eyed by most Samarnons as the only person who can run against the incumbent governor. The support of the majority of the members of the League of Mayors in the Province, the Philippine Councilor’s League, Liga ng mga Barangay and the Sangguniang Kabataan Federation to Uy’s gubernatorial bid, should the recall prosper, are positive signs for a change in leadership in the next few months. SN has yet to solicit comments from Governor Sharee Ann T. Tan and Vice-Governor Stephen James T. Tan regarding this report. SAINT BERNARD, Southern Leyte – That this municipality has always been a periodic place for a disaster-waiting-to-happen was bad enough. Worse, an early warning device installed just three months ago in a disaster-prone, interior barangay that would have alerted authorities of an impending earth movement was taken away. In spite of this discouraging fact, there is good news: the partner government organization from Germany which installed the stolen gadget did not “surrender” – it will be replaced and put up again not just in one barangay but two, said Mayor Rico Rentuza. The lost censor was one of six installed at barangay Malinao sometime in November last year, and it was carted January 4, a day after the local government ordered a massive, pre-evacuation of all the residents in the area at the height of the heavy rains. In other words, the device was spirited away during the time when no one in the barangay was looking as everybody was evacuated, Mayor Rentuza explained. The device had stored about two months’ data at the time it was carried away, Rentuza mused. He said the equipment was a first-time testing tool of its kind that promised to record ground-shaking as a way to predict possible occurrence of landslides so people can be duly warned and so can act accordingly. In an interview Saturday on the sidelines of a relief goods distribution by Metrobank, Rentuza said a technical team has been conducting a survey for the re-installation of the vital device in two locations, at barangay Bolod-bolod and at barangay Tambis II. With the survey done the soonest possible time, probably within this week, he hoped that the early warning system can be put up again, so it can serve its purpose well. And he thanked the German government organization, GTZ, for the undying support, for the continuation of the project despite what happened. As to the culprit who stole the device, Rentuza said the Police already had a suspect, and they are now closely monitoring this case. TACLOBAN CITY – Twenty six municipalities in Eastern Visayas are being considered for the national government’s Makamasang Tugon Project, the Department of Social Welfare and Development in Region 8 informed. Ms. Vina Aquino, Regional Information Officer of the DSWD Region said that Makamasang Tugon is a poverty alleviation initiative that capitalizes on human resources as assets to do the planning, implementing, and managing the processes in accordance with project guidelines. The 26 municipalities, which are from provinces of Leyte, Biliran and Samar, have implemented the KALAHI-CIDSS Project and the local government units and community volunteers are already knowledgeable on the KALAHI-CIDSS processes in the different levels, provincial, municipal and barangay, DSWD Assistant Regional Director Jaime Eclavea informed. ARD Eclavea identified the 26 municipalities as Bato, Capoocan, Javier, Julita, Kananga, La Paz, Leyte, Mahaplag, Mayorga, San Isidro, Tabango and Tabon Tabon in the province of Leyte; Paranas, PInabacdao, Sta. Margarita, Tarangnan, and Villareal in the proviince of Samar; Can-avid, Jipapad, San Policarpo and Sulat in Eastern Samar; Las Navas, Pambujan and Silvino Lobos in the province of Northern Samar; and Naval and Cabucgayan in the province of Biliran. When implementing the one-year Makamasang Tugon modality, the transition from KALAHI-CIDSS: KKB modality to Makamasang Tugon will be smooth. This augers well for the implementation of the new poverty-alleviation intervention should these municipalities be ready for the project requirements on or before the deadline of February 5, 2011. These municipalities should be ready with their 2009 Local Government Planning and Management Systems, Status Report on Sustainability Plan, and Status Report on Compliance with the KC Exit MOA, ARD Eclavea said.